About this Quick View Aluminum Zinc Tire Gauge:10-50 PSI pencil type tire gauge. Aluminum body with zinc alloy head.Material: Zinc alloy head; aluminum body. NOTE: Product comes with Prop 65 warning label. Label reads: "WARNING: This product may contain carcinogen, which is known to the State of California to cause Cancer and Reproductive Harm. For more information, go to www.P65Warnings.ca.gov. About this Highway 9- Piece Gift Set:Handle all roadside emergencies with this 9 piece highway gift set. The durable 600D reflective carrying case includes: collapsible funnel, 10 gauge jumper cables, warning triangle, gas siphon, blanket, 50 PSI tire gauge, one pair of rubber grip gloves and flashlight with 2 AA batteries. Carrying case can be used as emergency reflective warning strip. Material: 600d Polycanvas. Manufactured By Leeds. NOTE: Product comes with Prop 65 warning label. Label reads: "WARNING: This product may contain carcinogen, which is known to the State of California to cause Cancer and Reproductive Harm. For more information, go to www.P65Warnings.ca.gov. Special Instructions:Other imprint methods/areas may be available; please call for details. Please note that product images may not depict the standard imprint method included in pricing. About this Malta Torpedo Level:3 spirit levels, 6" ruler, magnetic edge, and end holes for hanging. Finish / Material: Plastic, Metal.Special Instructions:Rush Service:1. Purchase Order must clearly state artwork instructions and logo to be used.2. One Color/One Location Imprint Only. About this Life - Saving Hammer:Double-sided metal head shatters car windows in an emergency.Also features a built-in seat belt cutter.Material: ABS Plastic.Special Instructions:1 Day Rush, available upon request for 1 color, 1 imprint location orders. About this Highway Emergency Set:Emergencies can happen when they are least expected. Be prepared with this 7-piece highway emergency set. This set includes slotted and Phillips screwdrivers, one pair of gloves, jumper cables, socket set, socket driver and tire gauge, all packaged in a convenient duffel bag. The duffel bag has two strips of velco on the bottom on the bag, for easy attachment to the carpet in the truck of a car, to help keep the bag stationary during driving conditions. Material: 600d Polycanvas. Manufactured By Leeds. NOTE: Product comes with Prop 65 warning label. Label reads: "WARNING: This product may contain carcinogen, which is known to the State of California to cause Cancer and Reproductive Harm. For more information, go to www.P65Warnings.ca.gov. Special Instructions:Other imprint methods/areas may be available; please call for details. Please note that product images may not depict the standard imprint method included in pricing. About this Highway Companion Auto Safety Set:Provide safety and peace-of-mind when on the road. This 12-piece set includes 300-amp jumper cables, warning triangle, gas siphon, Mylar blanket for staying warm, two bungee cords, two glow sticks, a pair of gloves with rubber grips, flashlight (2 AAA batteries included), 50 PSI tire gauge, and carrying case with organizational pockets for securing the contents. Manufactured By Leeds. Note: Batteries Included: Yes Batteries Inserted: Yes Instructions Included: No Materials: 600d PC NOTE: Product comes with Prop 65 warning label. Label reads: "WARNING: This product may contain carcinogen, which is known to the State of California to cause Cancer and Reproductive Harm. For more information, go to www.P65Warnings.ca.gov. Related Search Terms: Safety KitSpecial Instructions:Other imprint methods/areas may be available; please call for details. Please note that product images may not depict the standard imprint method included in pricing. About this 3 In 1 Emergency Tool Set:Tire Gauge, Max: 50 PSI.Ball Pen With Black Ink.Aluminum Twist Action Flashlight.Batteries Included.Special Instructions:Rush Service:Catalog Quantities Only.One Color And One Location. About this Auto Safety Kit:2 AA Batteries Included.Reflective Tape On Back Side.Includes Jumper Cables, Gloves, Tire Gauge, Ice Scraper, Flat Head/Phillips Head Screwdrivers, First Aid Kit, Poncho, SOS Banner, Flashlight And Emergency Cone.Special Instructions:Rush Service:Catalog Quantities Only.One Color And One Location. About this Safety Digital Tire Gauge Tool:Be prepared for all roadside emergencies with this multi-function emergency safety tool. This 4 in 1 safety tool includes a digital tire gauge with PSI,BAR and KPA measurements as well as a window glass breaker, seat belt cutter and LED flashlight. Batteries included. Material: ABS Plastic. Manufactured By Leeds.Special Instructions:Other imprint methods/areas may be available; please call for details. Please note that product images may not depict the standard imprint method included in pricing. About this Roadster Gift Set:Four-piece set includes auto case, flashlight, tire gauge and Colonnade Twist in silver. The contoured case holds all gift set components. Flashlight includes 2 AAA batteries. Tire gauge measures up to 50 psi. Decorating not available on individual components. Manufactured By Leeds. Materials: Aluminum Number of Batteries: 2Special Instructions:Other imprint methods/areas may be available; please call for details. Please note that product images may not depict the standard imprint method included in pricing. 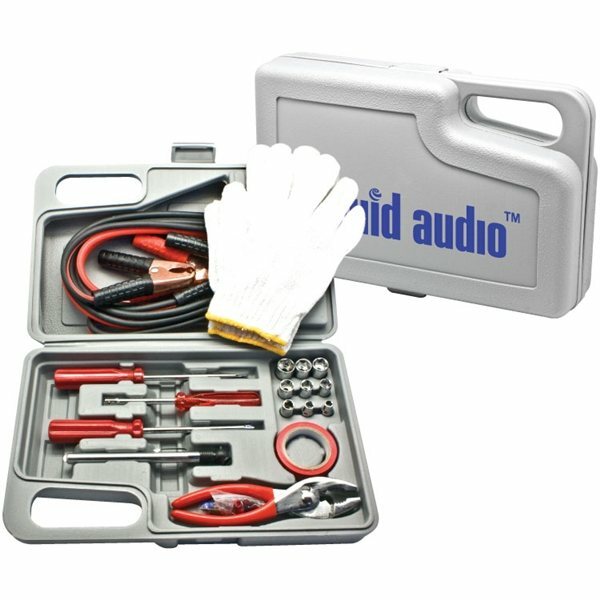 About this Inwood Auto Light Tool Kit:Auto light tool kit features two mini Phillips screwdrivers, two mini flathead screwdrivers, nine driver bits, eight sockets, reversible ratchet grip and extension, socket adaptor in a locking ABS flashlight case. Finish / Material: ABS Plastic, Metal.Special Instructions:Rush Service:1. Purchase Order must clearly state artwork instructions and logo to be used.2. One Color/One Location Imprint Only. About this Highway Jumper Cable Set:Set includes zippered Polycanvas carrying case and 200 amp booster jumper cables (7 ft./10 gauge. )Material: 600d PolyCanvas. NOTE: Product comes with Prop 65 warning label. Label reads: "WARNING: This product may contain carcinogen, which is known to the State of California to cause Cancer and Reproductive Harm. For more information, go to www.P65Warnings.ca.gov. Special Instructions:Other imprint methods/areas may be available; please call for details. Please note that product images may not depict the standard imprint method included in pricing. About this Tire Gauge With Clip:Max: 50 PSI.Made Of Aluminum.Special Instructions:Multicolor imprint is available, Please call for service.Rush Service:Catalog Quantities Only.One Color And One Location. About this Tire Gauge:Aluminum body.Reads up to 50 PSI. NOTE: Product comes with Prop 65 warning label. Label reads: "WARNING: This product may contain carcinogen, which is known to the State of California to cause Cancer. For more information, go to www.P65Warnings.ca.gov. Special Instructions:1 day rush is available on all in-stock items, one color/one location imprints, and laser engraved orders. About this Mini Double Ring Tire Pressure Gauge:This stylish mini tire pressure gauge is sure to make an impact! Featuring a keyring, it will also holds your keysIdeal for auto industry. Measures up to 50 PSI. Improve gas mileage by keeping tires properly inflated. Material: ABS (Acrylonitrile Butadiene Styrene) PlasticSpecial Instructions:Rush Service:The standard imprint method, 1-color/ 1-location is available. About this Highway Roadside Emergency Kit:Emergencies can happen at any time, and being prepared with this 24 piece kit keeps you well equipped. Includes sturdy EVA case, eight foot Zero degree Fahrenheit certified jumper cables, blanket, dyno flashlight, reusable hand warmer, reflective vest, poncho, gloves, and a First Aid kit with nylon case, ten adhesive bandages, four alcohol prep pads, and plastic tweezers. Manufactured By Leeds. Material: EVA NOTE: Product comes with Prop 65 warning label. Label reads: "WARNING: This product may contain carcinogen, which is known to the State of California to cause Cancer and Reproductive Harm. For more information, go to www.P65Warnings.ca.gov. Special Instructions:Other imprint methods/areas may be available; please call for details. Please note that product images may not depict the standard imprint method included in pricing. About this Glory Auto Emergency Kit:Tire-shaped ABS case includes crimping tool, gloves, tire gauge, jumper cables, electrical tape, spinner handle, 9 piece 1/4" drive sockets, copper wire brush, 70 terminals, 8 fuses, 2-way screwdriver, 8 piece combo wrench, thickness gauge, siphon pump, water bag, electrical tester, work light, 2 stubby screwdrivers, 20 cable ties, 3 open end wrenches and a first aid kit. Finish / Material: Plastic, Metal, Rubber.Special Instructions:Rush Service:1. Purchase Order must clearly state artwork instructions and logo to be used.2. One Color/One Location Imprint Only. About this Auto 3- in -1 Safety Set:Single bright white LED key-light with emergency auto window breaker and seat belt cutter.Slide switch to turn light on/off.Material: Polystyrene. 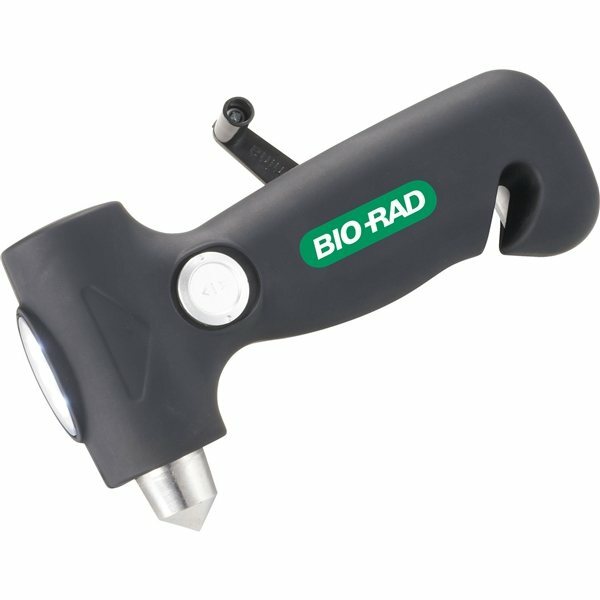 About this COB Light and Escape Tool:The COB Light and Escape Tool is an essential auto safety tool for all.It features a magnetic base, COB light on the side of the barrel with on and off button, seatbelt cutter, and window breaker.4 LR44 Batteries included.Material: ABS Plastic. About this Tire Pressure Gauge:Simple metal auto tool confirms that your tires are inflated properly, which helps improve gas mileage.Features pen-style aluminum body with black plastic head. Measures from 5 PSI up to 50 PSI (0.4 kg up to 3.5 kg). Includes metal clip to attach to pocket, visor or notebook. About this Safety Tool With COB Flashlight:Extra Bright White COB LightPush Button To Turn Light On/OffSteel Pointed Head To Shatter Glass EasilySharp Enough To Slice Seat BeltMagnetic HeadWrist StrapButton Cell Batteries IncludedSpecial Instructions:Rush Service:Catalog Quantities Only.One Color And One Location. About this Resqme(R) Auto Safety Tool:Multi-Use Spring-Loaded Stainless Steel Spike Head To Shatter Glass Easily.Guarded Stainless Steel Blade Is Sharp Enough To Slice Seat Belt.Easy To Use, Convenient, Compact Design.Used And Recommended By First Responders.Split Ring Attachment With Detachable Clip.Made In The USA. About this Emergency Hammer:Multi-function ABS plastic auto emergency tool with LED flashlight and window hammer.Magnet on back for attaching to any metal panels inside car or glove compartment for easy access.Sharp steel edges of hammer and seatbelt cutter are protected by removable clear cap.Uses 3 button cell batteries (AG3) (included and replaceable). About this Exec Autolight Kit:Phillips screwdriver, flathead screwdriver, pliers, cresecent wrench, 8 Allen wrenches, adjustable angle flashlight, safety flasher, hammer, cigarette lighter adaptor, ABS case with carry handle. Finish / Material: Plastic, Metal, Rubber.Special Instructions:Rush Service:1. Purchase Order must clearly state artwork instructions and logo to be used.2. One Color/One Location Imprint Only. About this Kirkwood Emergency Auto Tool:Emergency auto tool has a window breaker, flashlight, hazard reflector and flashing light, seat belt cutter, and two strong magnets for inside car storage. Finish / Material: Plastic, Metal. LED Light. Rubber Grip. Magnet for Hanging.Special Instructions:Rush Service:1. Purchase Order must clearly state artwork instructions and logo to be used.2. One Color/One Location Imprint Only. About this Vehicle Escape Tool:Energency Hammer. Hammer design to break windows in an emergency. Built-in seatbelt cutter in handle. NOTE: Product comes with Prop 65 warning label. Label reads: "WARNING: This product may contain carcinogen, which is known to the State of California to cause Cancer and Reproductive Harm. For more information, go to www.P65Warnings.ca.gov. Thank you Gianna and Camila! Our Highway Companion Auto Safety Set is a popular promotional product for car enthusiasts. Who needs roadside assistance with these helpful tools. Let your customers know how you truly care with this safety set. They will definitely thank you for the extra hand! This 12-piece set includes 300-amp jumper cables, warning triangle, gas siphon, Mylar blanket for staying warm, two bungee cords, two glow sticks, a pair of gloves with rubber grips, flashlight (2 AAA batteries included), 50 PSI tire gauge, and carrying case with organizational pockets for securing the contents. Allow your customers to drive with peace-of-mind. Purchase your order now! We will always make sure your product will be delivered to you the exact way you envision it. With the help of our art department, all details will be precise. This 31 Pc Roadside Emergency Kit will allow drivers to have a backup in their car for whatever reason. Your customers will be grateful for this Emergency Kit. Includes insulated jumper cables, flat head and phillips head screwdrivers, tire pressure gauge, 10-piece nut driver set, slip joint pliers, cloth work gloves, electrical tape, 12 assorted electric terminals and fuses, hard shell carrying case. Our customer service team is ready to help you complete your order today! Every car must have an emergency kit, but on top of that they escape tool offers double the assurance of safety. No matter the predicament a driver faces, the 3-in-1 handy tool will in tough situations. Whether it’s an automotive trade show or employee incentive. Customers and employees will definitely love this promotional tool because of the protection it offers. Three-in-one emergency safety tool includes hammer to break through glass, seatbelt cutter and dynamo flashlight. Crank handle to generate power. Rubber design handle for easy gripping. Don’t miss out on this great safety tool. Order here. On our current selection, we have over 100 promotional automotive tools your company can purchase. Whether it’s emergency tool kit, or booster cables your company can ensure safety in a customer’s vehicle. Allow your customers to take care of their vehicle, with our selection we provide the opportunity for customer’s to help fix their vehicle. The tools we have will help save your customer time and money from a mechanical trip. Tools are very helpful when found in a vehicle. Be a handy helper to your customer’s vehicle, because no one ever knows when mayhem occurs, especially on the road! View our set of automotive tools available in our selection here! Our custom automotive tools are durable, practical and effective promo items. Every eye catching piece is specially priced and professionally imprinted to vividly promote your brand long after it's handed out. Let’s make marketing make cents! Enjoy our huge selection of promotional automotive tools. Check out more cool automotive tools on sale now! Take a sneak peek at our stock of customized automotive tools currently available. Feel free to give us a call, and we’ll help expedite your order! It’s no wonder emergency tools are so popular. A driver’s safety continues to be the number one priority in the automotive industry. So why not join in, and let your customer know how much you care for their safety! Get a sample of our automotive tools, so you can see how reliable our products are. Whether it’s a flat tire, dead battery, or seat belt problems our tools will help your customer fix the issue. Be the help your customer needs with our custom automotive tools.